Where the ocean breeze really DOES whisper through the pines, you'll find yourself unwinding and de-stressing before you've unpacked your bags! The tranquil setting will energize you for exploring the history, attractions and nightlife of beautiful St. Augustine. 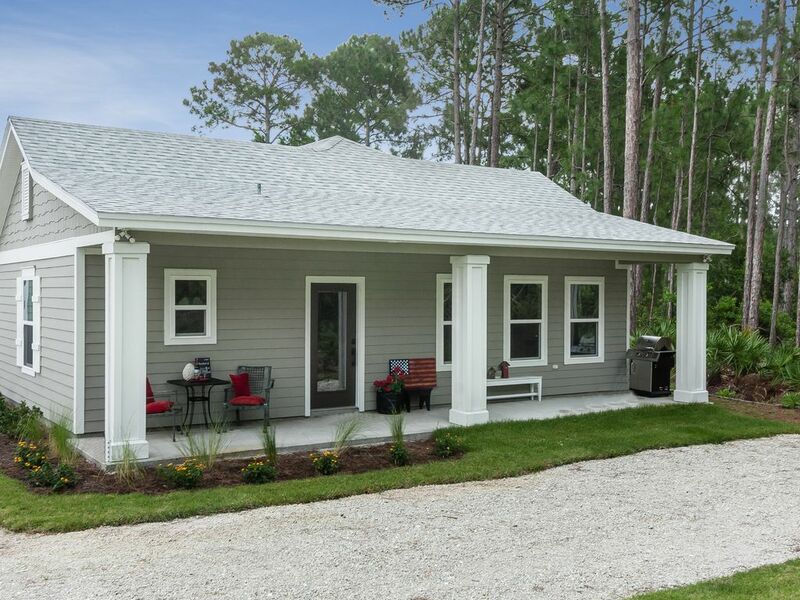 Located "next door" to the Matanzas National Forest, Moses Creek Conservation Area and the Atlantic Intracoastal Waterway, Pine Breeze Cottage is the perfect base camp for pursuing outdoor adventures. Imagine yourself fishing, kayaking, boating, hiking, and biking in an unspoiled setting as you experience a slice of Old Florida. Captivating Crescent Beach is only minutes away, and a 7 mile drive south on scenic A1A will take you to historic Fort Matanzas, Washington Oaks Gardens State Park, the River to Sea Preserve, Marineland Dolphin Adventure & Bing's Landing. We both thoroughly enjoyed our stay!! Both Jana and Garth couldn't have been nicer. If we are ever in the area we will definitely stay again. I highly recommend this property! Terrific cottage in a lovely neighborhood. The cottage is well equipped, beautifully decorated and sparkling clean. The location is about 10 minutes from Crescent beach and about 25 min from historic St Augustine. Nice biking in the neighborhood and the close by Moses Conservation Area. The hosts are wonderful! There were homemade cookies and a bottle of wine when we arrived - just a great way to start a vacation. Don't miss the wild turkey and deer that wander the neighborhood. The water did smell of sulphur during our stay, but the owners provide bottled water and it wasn't an issue for us. This was a great stay! Jana was more than happy to give advice on local places to go to! She had drinks in the fridge and cookies on the counter for us when we got there! If you are going to St. Augustine and need a very nice and affordable place to stay, this is it!!! The cottage is attached to the main house. It is tastefully decorated and very comfortable. The outside sitting area borders on a woods. The neighborhood is very quiet and welcoming. It is off 206 so very conveniently located neat Route 1 or A1A. Nice beach in Crescent Beach. Lovely hosts. They provided a welcoming libation and homemade cookies. There were cooking supplies as well as breakfast cereal, hot chocolate, coffee etc. Absolutely lovely cottage and our hosts were just as gracious and responsive as others have said. those extra touches like the cookies and wine were very much appreciated. They appear to be committed to mitigating the ubiquitous Florida sulfur odor to the water which is really the only real downside to this great getaway.